Tenor saxophonist Dayna Stephens is poised, poetic and furiously swinging on his second Criss Cross effort, I'll Take My Chances, a follow-up to his remarkable 2012 release Today Is Tomorrow (Criss 1345 CD). The quintet features guitarist Charles Altura, a newcomer to Criss Cross and a key melodic and solo voice throughout. Pianist Gerald Clayton, returning to Criss Cross after sideman sessions with Kendrick Scott and Michael Rodriguez, brings keen virtuosity and harmonic insight to Stephens' challenging, deeply lyrical compositions. Bassist Joe Sanders, who issued Introducing Joe Sanders (Criss 1344 CD) on Criss Cross in 2012, achieves an effortless sense of connection with drummer Bill Stewart, a veteran of over 20 Criss Cross sessions, not to mention one of the great influential players of the last 20 years. Along with 5 originals, Field of Landmines by Stephens and Marcus Gilmore, Adrift by Aaron Parks (the pianist on Today Is Tomorrow) and a hard-swinging reinvention of Brad Mehldau's Unrequited , Stephens also includes a rhapsodic treatment of Ellington's Prelude to a Kiss , featuring guest vocalist Becca Stevens. 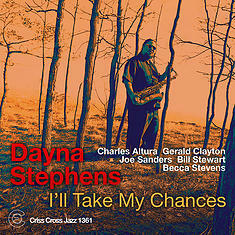 There's also a striking departure: a track with Clayton on organ and the leader on husky, soul-drenched baritone sax.